I like to display lots of different styled hanging hearts in my home as I feel that it gives such a rustic, unique vibe. This is one of the reasons why I like to display handmade stuff as everything is unique and made with love. Thayres A Difference is an Etsy shop run by Paul Thayre which sells lots of shabby chic home décor. Lots of his work is decoupaged, and you guys know how much I adore decoupage! 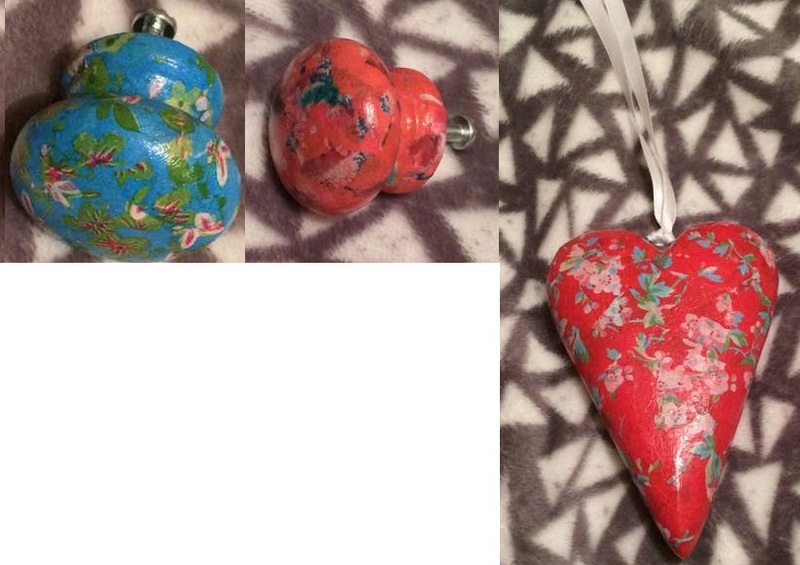 I ordered a gorgeous decoupaged hanging heart and 2 decoupaged door handles. The hanging heart is very nicely sized, it's larger than I thought it was and there's plenty of ribbon so I think that it would look nice hanging from the fireplace perhaps. Or somewhere else in the home where there's plenty of room for it to hang and look lush. The decoupage looks professional, there's no folding or visible boundaries between the decoupaged areas and the painted areas. Moving on to the knobs, they are decoupaged really nicely also. Again, there is no creasing or visible lines where the decoupaging ends. Also, Paul has included screws on the back of each knob which is enormously important - some Etsy sellers do not do this and I think that it lets them down a little. So Paul's door handles are cute and ready to be installed - no faffing about at all! Which is what we want. They have been varnished as well so they will last ages without getting damaged, they're lovely and shiny. Definitely check out Thayres A Difference for cute hand crafted homeware at decent prices.